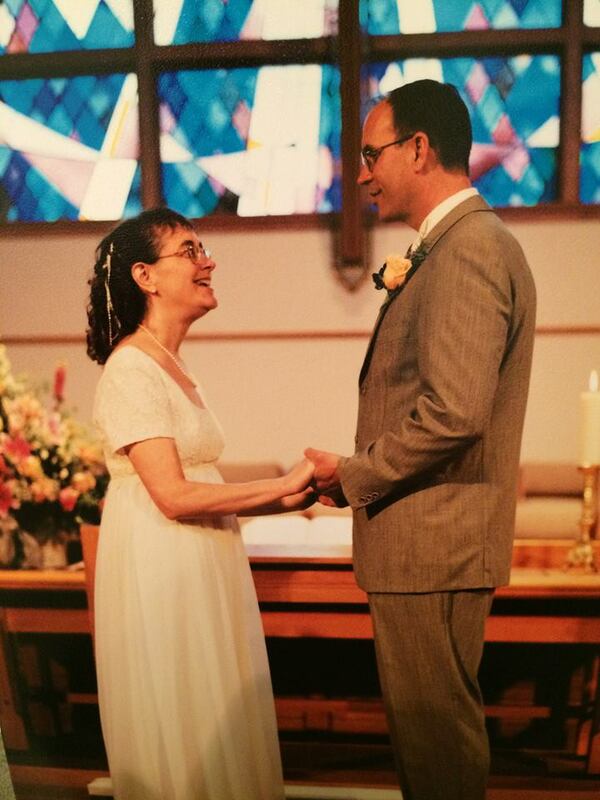 There we are on our wedding day, May 18, 2002. Gosh! We look so young you can’t even tell we are 43 and 44 years old (she said while wearing her rose-colored glasses). I remember that day like it was yesterday! For both of us, it was our first – and we have pledged! – only marriage. First time for two folks in early middle age. Steve’s parents were married when his mom was only 19 and Chuck was 25. My mom was 23 and my dear old dad was 27. It seems so young to me! 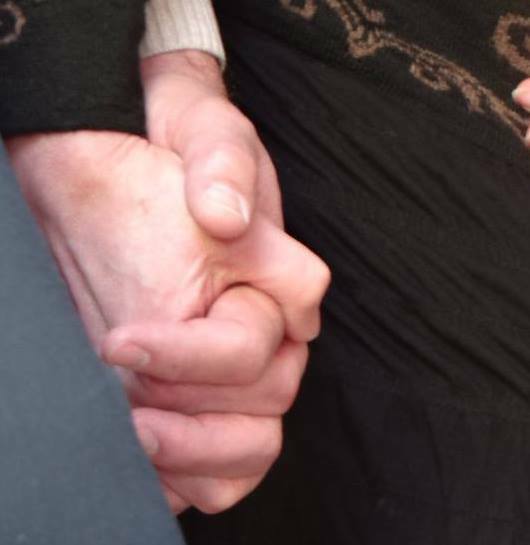 So there we are, standing in the church for pictures on the big day, and I love this one because we are holding hands. We get teased often at church for our PDAs: public displays of affection. We often hold hands, stand arm in arm, and even exchange kisses. It’s still first love for me. It always will be. We did meet at church, in Sunday school actually. I sat in the front row with Jana, and Steve sat in the last row. He used to tease us for being “teacher’s pets” and I accused him of flinging arrows at our heads from the back row…figurative arrows. Somehow we were friends who liked to tease each other and then we ended up on the adult education committee together. Our families joined together with other friends after church for lunch on Sundays at Arby’s. Our pastor George and his wife Pam were part of that group. After we got engaged, George shared the story of how he woke up in the middle of the night after having dreamed that Steve and I would be married someday. He woke Pam to tell her, too. Oddly enough, it was before any of the rest of our “keeping company” started. He just had a vision and I have always loved that story. Anyway, how we eventually ended up going out that first night is another story for another day. It involves a letter from me and then a returned letter from him. It’s not fodder for an HBO mini series, but I am sure there will be a movie about it someday. Steve will be played by Kevin Costner and I will be played by…me. The first night we went out was exactly one year before that wedding picture: May 18, 2001. We met at Delice, a bakery/bistro in Omaha’s Old Market area. He had a cup of coffee and I had a Diet Coke. We each paid for our own. I had nothing else to compare this to as I told Steve, “This is my first date. With a man. Ever in my life. Did I tell you I was 42?” That was the truth! After our caffeine intake, we decided to walk a bit farther into the market for dinner at the Upstream Brewery. And that is when it happened: he reached out for my hand. And for the first time at the advanced spinsterly age of 42, for the very first time, (did I stress that enough?) my hand was nestled into the larger hand of a man who was not my father, not my uncle, not my grandpa. And I will never forget the wonder of that feeling. I can close my eyes and see us walking down Howard Street, hand in hand, and thirteen years have melted away. I knew then and there I would marry him someday, so it was funny when George told us of his dream. I also experienced my first kiss that evening, but this story is not about that either. It’s about holding hands. At dinner that evening, Steve ordered a burger and I ordered a salad. My whole self was just in shock that I was even there, and I was so enthralled that I just couldn’t eat, so Steve finished mine. But that was the end of the meal. The beginning went something like this. Steve said, “Should we say grace?” And I just nodded, knowing I couldn’t say anything. He reached his hands across the table and took both of mine in his and thanked God for our meal. And we have never done it any other way. I think of how many times we have prayed hand in hand like that in the last thirteen years. So many meals. So many church services. Weddings. Funerals. We have prayed for our family members in their joys and sorrows; we have prayed with and for our friends in theirs as well. We pray with our small group when we gather to share lives and learn more about our God. We have prayed on trips to be with the church in Germany, the Czech Republic, Iraq, Lebanon and Syria. We have prayed for peace, over and over again. I know when we join our hands like that, God meets us right there as we pray. And so this picture means so much to me. We were in Damascus, Syria, in January with The Outreach Foundation. We had traveled to Lebanon to be with the National Evangelical Synod of Syria and Lebanon along with other global partners of NESSL. Sixteen of us made the short journey to Damascus to be with the church in a country that had been at war for almost three years. They still are, and we continue to pray for them even now with the news of the impending U.S. participation in a plan against ISIS. Oh! How we pray for peace. While we were in the church service that day, surrounded by the members of the Damascus congregation plus the refugees who had fled other parts of Syria to be there, we bowed our heads in prayer as we have done so many times. And we reached out our hands to each other as we have done so many times. And somehow that caught the eyes of a photographer and this photo was posted on Facebook. If there is only one picture that you can pick to describe the life you have shared with that one person you know God picked for you personally, this is the photo I would pick to tell the story of Julie and Steve. And they are not the hands of Kevin Costner. They are Steve’s, and they are mine. Hand in hand. I think Pam was as surprised to hear it firsthand as I was to hear it secondhand. There was just no indication that this would happen. Beyond that, I love the story about your uncle. Such a smile it brings to my face to hear you tell it!